SYDNEY (CNS) — The widespread use of contraception has led to increased violence and aggression against women, the theologian of the papal household said during a mid-July visit to Sydney. 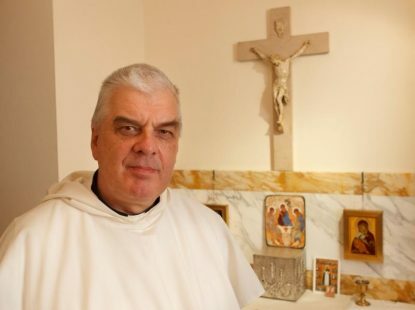 Dominican Father Wojciech Giertych, appointed to his position by Pope Benedict XVI in 2005, said that the contraceptive mentality has distorted male sexuality, leading to violence towards women. Father Giertych said government statistics in Italy revealed that a woman was murdered every four days from 2009 to 2011. He said more than 80 percent of the perpetrators were sexual partners of the victims, such as boyfriends and husbands, or former partners. Even more violence is carried out against women in other countries, he said, pointing to Mexico, where six women are murdered every day, according to reports in L’Osservatore Romano, the Vatican newspaper. “In the hearts and minds of these men there is the treating of the woman as an object to which he has a right. This deforms the male, freeing him from all responsibility,” Father Giertych said. “When such a significance is attributed to sexuality this does not give ultimate happiness and so it functions like a drug constantly demanding more, and then this leads to violence,” he said. Given that the rate of women being murdered is so high, it’s likely that many more women are abused by their male partners, he added. The introduction of the birth control pill nearly 60 years ago has led to what the priest called a demographic winter in many countries and to a lack of interest in marriage and fatherhood among men. In 1968, both Blessed Paul VI and St. John Paul II, before he became pope, predicted that contraception would distort human sexuality, he said. St. John Paul, then the archbishop of Krakow, Poland, was part of a group of theologians from his archdiocese who sent a memorandum to assist Blessed Paul prepare the 1968 encyclical “Humanae Vitae” (“Of Human Life”). The memorandum explained that contraception generates egoism. “Self-mastery, self-gift and disinterestedness are eliminated for the sake of pleasurable experience, satisfaction of the senses or emotion. Such acts not only do not constitute true love, but when repeated, necessarily lead to the destruction of love,” the future pope wrote. Counter to such feelings, a respect for procreation and the mutuality in the Christian vocation that ultimately leads to sanctity that encourages growing love in couples, Father Giertych said. “The important thing is to grow in mutual charity, and also in chastity which serves charity,” he said. Father Giertych rejected the idea that “Humanae Vitae” could be reinterpreted in view of Pope Francis’ 2016 apostolic exhortation, “Amoris Laetitia” (“The Joy of Love”), which offered his reflections on modern family life. He said Pope Francis’ exhortation primarily is a pastoral document.